A Birmingham mum has issued a warning to parents after her daughter's body turned bright crimson after she was bitten by a SPIDER. Panic-stricken Penny Jordan rang paramedics as the venom spread like wildfire through four-year-old daughter Elle's body. Her foot ballooned and a vivid red rash spread from her leg to her stomach, then her neck. She recovered but medics have confirmed a spider was responsible. Penny had no doubt her daughter was bitten by one of the large creatures she's seen scurrying across the floors of her Northfield home. "They're huge," said the mum-of-seven, "But because they come into the house from outside, there is not a lot we can do. I have six grandchildren. I don't want the same happening to them." The shocking incident comes as the city braces itself for a plague of over-sized arachnids, bloated by the hot summer and now seeking refuge in our homes. Penny, 38, called paramedics on Sunday night as the rash moved over Elle's body at an alarming pace. The mum said: "I want to make parents aware that a simple spider bite can have serious consequences. I was horrified as the rash spread. It looked like she'd been severely scalded. They were just like burn marks." Penny and partner Pete Hands first noticed something was wrong on Sunday afternoon. Elle, forced to pull out of her first full day at St Brigid's Primary School on Monday, woke-up with a livid red patch on the top of her leg. But within hours, it had invaded her body. Elle's temperature was also rising. Penny and Pete took their child to a walk-in medical centre where staff discovered an insect was to blame and prescribed a course of tablets. But drugs did nothing to stem the rash and when it moved to Elle's neck paramedics were called. They made her comfortable, but ruled out hospital. Penny added: "At first we thought Elle had been bitten outside, but I've seen some very large spiders in her bedroom and wonder if one of those attacked while she was asleep." 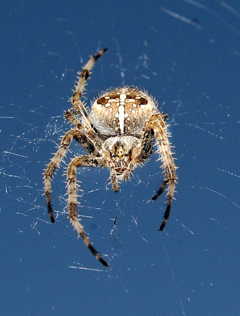 Britain may not be noted for its dangerous insects, but is home to 14 spider species that can deliver a painful bite. Most venomous is the false widow which has moved to this country from abroad, but others that pack a punch are cupboard, woodlouse, lace weaver, black lace weaver, wolf, bark sac, stone, cross, money and wasp spiders. Elle may have been attacked by the giant house spider - a common visitor to homes in autumn and often found in baths. They can grow to five inches and possess a potent venom, but don't usually strike. Spider expert Professor Adam Hart explained the surge in sightings. "This year has been seemingly a good one for the invertebrates which spiders feed on, and it's quite mild out there," he said. But he stressed the arachnids do more good than harm, providing a free pest control service. "They often feed on the most common species, preventing a few species from becoming dominant," he said. "We want to encourage people to respect and learn more about their little house guests." There are three types of allergic reactions to stings or bites: minor localised, large localised and systemic. The latter is potentially life-threatening. An NHS spokesman said: "If you have a large localised reaction after being bitten or stung by an insect, a large area around the bite or sting will swell up. "The area may measure up to 12 inches across, or your entire arm or leg could swell up. "The swelling will usually last longer than 48 hours, but should start to go down after a few days. "You're more likely to have a systemic reaction if you've been bitten or stung before and become sensitised, particularly if it was recently."